See the smiling, shining faces of the NBA's superstars and supporting players like you never have before. There has never been an NBA offseason like 2017. More than a dozen former All-Stars switched teams. Super teams blew up and came together, sometimes in the same place (hello, Cleveland). And The Process was trusted in some very expensive ways. All the unbelievable moves might have left you feeling like you need a program to get reacquainted with the NBA world order. We have something even better: an NBA Yearbook. 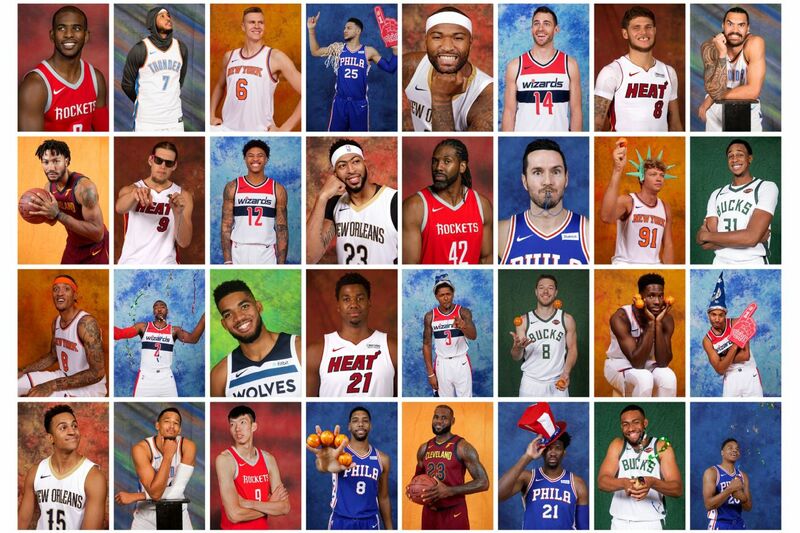 Get ready to pick your favorite background (sorry, no laser option) and cite your favorite quote as we turn NBA Media Day into School Photo Day for the Most Likely to Succeed, the Class Clown and everyone in between. President Boogie? : [Is there something you think you would have been president of?] S---. If Trump can do it, I know I can do a better job. Favorite Quote: You miss 100 percent of the shots you don't take. Favorite Quote: Walk by faith, not by sight. Favorite Quote: If you can't be on time, be early. Favorite Quote: Trust the process. Mother Knows Best: My favorite quote is what my mother used to always tell me, just basically knowing the difference between right and wrong because if not, then you can always get yourself in trouble. Favorite Quote: Never satisfied, so determined. Favorite Quote: Hard work isn't punishment. It's my reward. The Fame Game: I'd rather be successful than famous, for sure. I mean, the Kardashians and Jenners are famous. Don't Save the Last Dance: [At high school dances...] I was the guy that didn't go. Favorite Quote: Stay ready so you don't gotta get ready. Kid's Got Jokes: Oh man, I was just a class clown, I'm not gonna lie to y'all. I just made jokes. ... I just kept everybody in the classroom laughing. Favorite Quote: Every day is a good day until you miss one. Best In Show: I would be president of the Pet Beard Club. My beard is a pet. Favorite Quote: Better late than never. Never late is better. Favorite Quote: I believe actions speak louder than words. So I'm gonna be quiet, and I'm gonna work. Favorite Quote: If you want to breathe as bad as you want to succeed, that's when you'll be successful. Favorite Quote: Hard work beats talent when talent doesn't work hard. Favorite Quote: The greatest revenge is massive success. Best Served Cold: I don't think I got voted most likely to do anything. But I think I proved them wrong by making it to the NBA. Favorite Quote: Humble and hungry. Back to School: I just learned of this guy, Sisyphus, who used to push this rock up a mountain all day, and that's what. ... He was banished to push a rock up a hill all day. But what somebody related it to is the grind. You've gotta push that rock up the mountain all day, and even if you get to the top, you've gotta roll the boulder back down and do it again. Favorite Quote: Getting better every day when you wake up in the morning. Favorite Quote: One thing you do know is that you never know. And you're never gonna know, ever. When's Lunch? : [If I wasn't in the gym, you could find me] at the cafe. Favorite Quote: If you don't stand for anything, you'll fall for everything.